(7/31/2011; 10a PST) The first round of the 2011 U.S. Open is now underway at the U.S. Go Congress in Santa Barbara, CA, with the top three boards being broadcast live on KGS every morning starting around 9a PST. Pairings and game records — including game commentaries — can be found online. Check back for updated pairings, results and game records throughout the week! 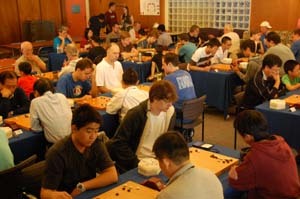 - Redmond Cup: the four finalists in the 2011 Redmond Cup will compete live from the U.S. Go Congress in a special E-Journal broadcast at 3p PST (6p EST) Sunday on KGS. 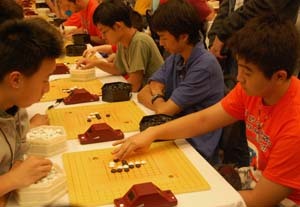 The players are Gansheng Shi 7d vs. Calvin Sun 7d and Aaron Ye 4d vs. Sammy Zhang 3d. - North American Ing Masters: top boards in this 16-player tournament will be broadcast live on KGS starting at 7p PST. 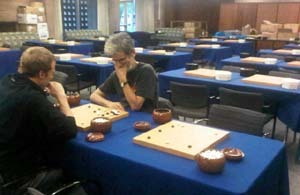 Photo: American Go Association President Allan Abramson (r) enjoys a casual game Saturday morning as the 2011 U.S. Congress gets started on the UCSB campus in Santa Barbara, CA. photo by Steve Calburn. 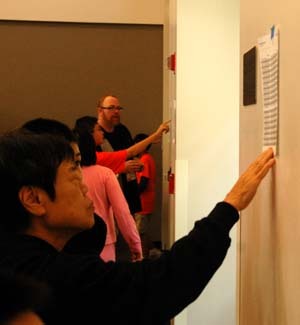 The 2011 US Go Congress begins Saturday in Santa Barbara, CA, but attendees are already arriving from around the world. 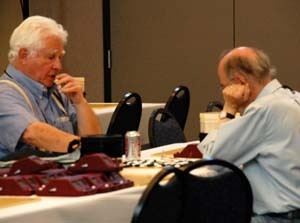 “This year, many attendees have opted to arrive early and enjoy the air, the beach, and the other go players before anything official starts,” says Congress Co-Director Andrew Jackson (at left, playing the UK’s Francis Roads on Friday night). “They are as excited as we are to greet the 20 attending professionals and nearly 500 fellow go enthusiasts who will be coming to Santa Barbara this year.” Not signed up yet? It’s not too late; click here for details and to register. Click here to see all the 2011 U.S. Go Congress reports, including recent tips on Checking In/Registering, Other Games, Transportation & Parking, Arrival/Registration, Sign Up Online for Congress Pair Go and more. How can I make my registration go quickly and smoothly? The easiest way to speed up the registration process is to register for tournaments and events, turn in any paperwork, and pay your remaining balance before you arrive. You will be able to make changes once you arrive, but registration will go much more quickly if your changes are already made. Registration will be in Corwin Pavilion (r), the Congress’ main playing area. What time does registration start? Registration will officially open at 10am on Saturday, July 30. If anyone plans to arrive before that time and would like to check in, please email registrar@gocongress.org or call 805-769-USGO to make arrangements ahead of time. Where can I pick up my keys? After you receive your room assignment, you may pick up your keys at your residence hall. Volunteers will be available with maps to answer any questions that you may have. 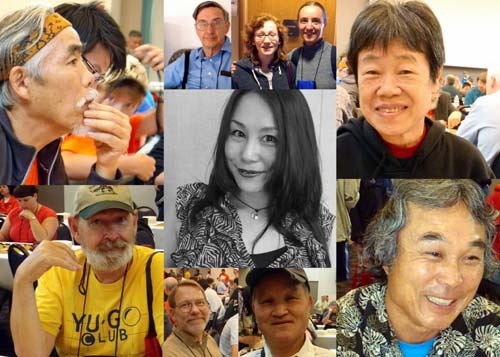 In addition to our regular ongoing go news and updates, the E-Journal is publishing a special series of updates this week on the 2011 U.S. Go Congress, which begins next Saturday, July 30 in Santa Barbara, CA. If you have any questions about the Congress, email Lisa Scott at lisa.scott@gocongress.org and watch the E-Journal this week. If you prefer the weekly EJ to more regular updates, you can always change the preference in the “UPDATE YOUR PROFILE” link at the bottom of every EJ. Shocking as it seems, there are apparently a few games other than go that get played at the annual U.S. Go Congress which starts this Saturday in Santa Barbara, CA. 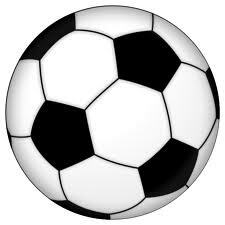 Soccer: Longtime Congress soccer organizer Terry Benson reports that there will be soccer “Every afternoon except the first Saturday and Wednesday” most likely at 4:15, at a site to be determined. “Come one, come all!” Benson urges. Tennis: Chris Garlock and Lisa Schrag are also planning to organize tennis around the same time; watch for updates as details get nailed down this Saturday. Bring your racquets or rent them at the College. Poker: No details have surfaced yet but it’s a sure bet that poker will be played at the Congress, most likely in the usual late-night sessions; email us at journal@usgo.org if you have details on this or any other such activities Congress-goers should be aware of. How do I get from the Santa Barbara Airport to the Congress? UCSB will provide a free shuttle to and from the Santa Barbara Airport for Congress attendees. Call 805-893-2772 when you arrive, and the shuttle will pick you up shortly. Attendees arriving on Friday, July 29 may also use this shuttle service. Depending on the number of attendees needing these shuttles, shuttles may be available on other days as well. This shuttle will only drop off at the Santa Rosa Residence Hall, steps from registration. How do I get from the Goleta Amtrak station to the Congress? We recommend taking a taxi. Using public transportation includes a one mile walk that most attendees will probably want to avoid. How do I get from LAX to the Congress? The Congress has arranged with Santa Barbara Airbus for group transportation on their regular shuttles. 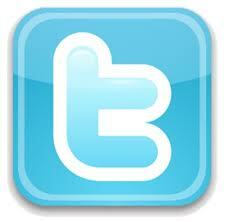 Mention the US Go Congress to receive the lowest price: $28 per person one-way. Santa Barbara Airbus will add a stop at UCSB, but will not make additional pick ups or drop offs. YES. All Congress attendees will receive an Unloading Permit in their email. If you do not receive an unloading permit, please contact lisa.scott@gocongress.org for a second permit. 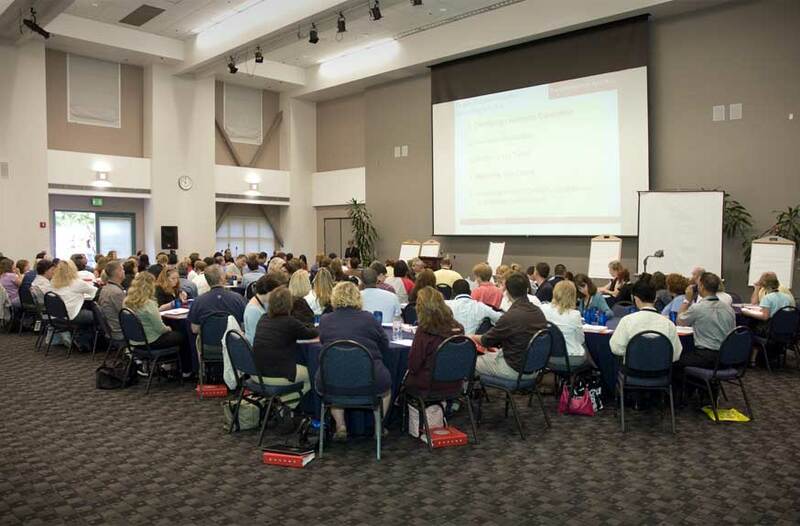 The E-Journal will publish a special series of updates this week on the 2011 U.S. Go Congress, which begins next Saturday, July 30 in Santa Barbara, CA. If you have any questions about the Congress, email Lisa Scott at lisa.scott@gocongress.org and watch the E-Journal this week.